People may think towing by themselves can provide the same results as getting a professional towing service provider. After all, how difficult can pulling cars or vehicles for some distance? It may seem to be a just proposition, however there are hidden risks involved. Here we shall examine the risks below. Professional tow truck companies have access to a wide range of equipment, tools and accessories for their works. Common drivers may not have or accessible to these items, let alone the technique and experience in operating them. Common tools such as hitches and towing ropes may be obtained for self use purposes, but if they are incorrectly used, damage to the towing vehicle and the load may occur. For instance, when the connection between the towing vehicle and the load or trailer is not secure, chances are either damage to the bumpers or worse, load is disconnected during towing and accident may arise. Tow trucks consist of specialized axles, equipment and frames which give a towing truck the capability to tow vehicles. The towing capacity of different vehicles is specified by in the manual of respective vehicle manufacturers. Another guideline to note is the Gross Combined Weight Rating (GCWR) of vehicles; they are specific weight spelled out by manufacturers to be the maximum weight of a loaded tow vehicle. One should never exceed the listed GCWR when towing. However, for non-professional towing, people may overlook this important aspect. Overlooking this important guideline may result in damaging the engine, brakes and transmission of the towing vehicle, and could even put other motorists on the road to potential hazards. Driving with a loaded vehicle is different from a free, unloaded vehicle. This is because the towing vehicle will be heavier than usual, and will take longer time to brake, stop or make turns. When driving with loads, drivers need to be aware of their driving style and methods and adapt to them. For instance, there is need to make wider turns to prevent hitting curbs. Driving down or uphills need to be extra cautious to prevent mishaps from occuring. When a person is untrained in towing and tries it out with makeshift tow truck tools and equipment, the chances of getting injured is much higher. Some may think engaging towing service may cause unexpected damage to their vehicles, however this is actually quite the opposite. In fact, self-towing poses potential hazards to inflicting injuries to both the people towing and the passengers or drivers near them. Furthermore, mistakes may occur when they try to lift or unload the towed vehicles at destinations, rendering wasted efforts. 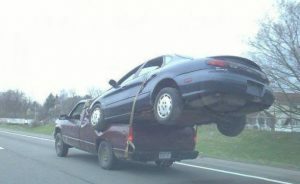 To summarize, if one has knowledge and technique in taking the right steps in towing, safety can be enhanced tremendously. On the other hand, if one is not sure of the correct steps and procedures in towing, it is advised to hiring a professional towing company to serve you.